While the courts work out whether drones can or can’t be used commercially, regular people continue to have access to them for personal use. And interest is clearly rising. Horizon Hobby’s Blade 350 QX is one of the more popular, affordable hobbyist models available to the public. I recently had the chance to fly it in a few San Francisco parks and found it to be a solid option for a personal quadcopter, with a few setbacks. I expected that there would be some quirks. When I flew the DJI Phantom 2 Vision last year, it required a goofy dance where I spun the drone in circles to get it calibrated. But the 350 QX had some even bigger quirks that were compounded by shortcomings in Horizon Hobby’s manual and online videos. It felt like a device better suited to an experienced hobbyist than a beginner just interested in capturing great aerial footage. 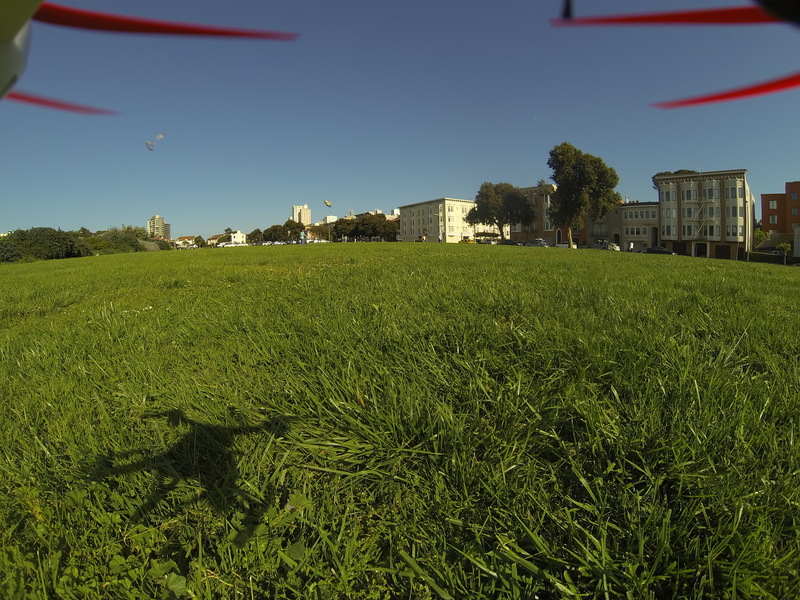 San Francisco’s Great Meadow Park, as seen from a GoPro attached to a Blade 350 QX. Photo by Signe Brewster. The first time I flew the 350 QX, it took me 30 seconds to get it into the air. Then it stopped cooperating before the next flight. Sometimes it emitted a series of beeps. Other times it just refused to starts its propellers. The 350 QX comes with an instruction manual that at times is poorly organized and full of jargon. Blade also has a series of well-meaning, straightforward videos available on its site that are more clear on how to fly the 350 QX. But something was missing from what they were telling me about preparing the quadcopter for flight. A glimmer of help came when I called Horizon Hobby directly. When you land the 350 QX, you pull down on one of four knobs, which are known as trims. The trims are also involved in readying the drone for flight, so before every takeoff you need to “center” them. After I flew once, I moved the trims out of their proper place and got no hint from the manual on how to fix them. An online video indicates that you need to “center” them, but when you are a beginner the instructions provided are not thorough enough. Centering the trims goes like this: Pull each one down and then up (or to the side) until it emits a loud beep. Then pull it the other direction until it does the same. If you can pull it one more notch again and elicit another beep, then you have it in the right place (but be sure to notch it back again to where it was before the final beep). If all four trims are in the right place, the drone will emit a “happy” tone. If it doesn’t, you need to start over and redo each of the trims. Simple, right? It’s not unusual to need to do some form of calibration before flying a drone. But the 350 QX’s system was incredibly time consuming and annoying. The manual doesn’t explain it, and neither did the videos online. I talked to Horizon Hobby three times. Each time, my helper explained how to get the trims centered. But they never described the process clearly enough for me to grasp it on my own. The last time, they actually said they were stumped why the drone wouldn’t start. After I finally figured out the process on my own, the drone started every single time. My other gripe was about the battery. Charging it is not as simple as just plugging it in and waiting. I ruined the first battery just by leaving it plugged into the drone overnight. Then the spare wall charger Blade sent me (the standard 350 QX charger attaches to your car battery, but I don’t have a car) didn’t work. The second one did, but it involved knowing the type of battery and pressing a series of buttons on the charger to get it charging. It sounds like a silly problem, but I am guessing that like me, most people have never been exposed to this kind of battery. Once the 350 QX is in the air though, it really is fun to fly. It has three modes to choose from–known as smart, stability and agility–depending on how advanced you want to be with your controls. Each mode is intuitive and easy to grasp. The drone responds quickly to commands, which is great for agility but sometimes an issue if you want to collect super smooth video. It has a disappointingly short battery life of 10-15 minutes though. Any time you are flying a drone, it is really important that you feel you can trust it. The 350 QX acted exactly as described when it came to safety features, which made me feel very comfortable. It has a switch that commands it to return to the spot from which it took off and even in strong winds it was capable of holding itself steady in the air. However, these features are reliant on a GPS signal, so when I flew it in denser parts of San Francisco (and in the Gigaom office) where a signal is not possible, it was much more difficult to maneuver. When a signal was available, the 350 QX never had a problem picking it up automatically. I used the 350 QX with a GoPro. The drone came with a plastic frame that attached to its bottom. The GoPro produced beautiful video, but the frame was one of the quadcopter’s most annoying features. Unlike the DJI Phantom Vision’s camera, which you can reposition from your phone, the frame is static. There is only one possible angle for taking video. It is also attached to the drone via two plastic plates held together by four rubbery pieces meant to stabilize the camera. But if the quadcopter crashed, they popped out nearly every time. There is no easy way to reattach them without unscrewing the plates altogether. The best solution is just to learn how to not have a crash landing every time, but that takes some practice. The 350 QX comes with a mount for a GoPro camera. Photo courtesy of Blade. If you do expect to have a lot of crash landings, consider that the 350 QX is plastic. It feels flimsy. I never broke anything during a flight, but I did manage to crack the plastic piece that sits over the battery enclosure the first time I went to remove the battery. It does keep the drone ultralight though at just 1.5 pounds. I trucked it around in a backpack without any problems. If you are ready to put some work into getting to know a quadctoper, the 350 QX is a very reasonable option. It is competitively priced at $420 or $470, depending on if you want to provide your own controller, and seemed easy to repair if one of its parts did break. I had a great time flying it and would consider it an option if I already owned a GoPro. But overall, I would choose the DJI Phantom over the 350 QX in a second. This post was updated on April 23 to state that Horizon Hobby is the maker of the Blade 350 QX. Hello Signe, I’m just looking for a reliable quadcopter to lift my GoPro camera. I found many good reviews about this Phantom Â http://quadcopterfly.com/phantom-quadcopter-gopro-mount-new-trends-aerial-shooting.Â Do you have any suggestions? Thank you. Lost my first one in Ocean! Camera and all ! Ouch!! Flew it many times and had everything centered. It took off fine, but I forgot to turn on the GoPro, filming in the Philippines.It came down then up then It just kept going higher. You need to think FAST. With no control I could just hold the return switch. It did come down but flew east into the sea. It was retrieve by kids diving for food 2 days later, maybe switching off the controller would have crashed it sooner? The store I bought it from helped me get a new one for cheap. but now I am afraid it will go crazy again. I fly now in blue mode, Green or safety mode counts more on systems that might not always work!!?? I’m onto my second 350QX. The first disappeared into the sun and I found it 10 minutes later splattered in a carpark. The second tried to escape as well, climbing away from me and out to sea. It dawned on me that the auto return-to-home feature wasn’t working. I turned it off and was able to ease the quad back to land with only 3% battery life remaining. Since then I have discovered that the Gopro interferes with the GPS signal when its wifi is turned on,and kills return-to-home. To fix it you need to split the Quad body in half (32 screws) and shield around the battery under the GPS with foil. My first 350 has been rebuilt after replacing the body and recalibrating (sent it away), so now I have two working quads. The Gopro however was trashed, a big ouch, and I’ve only recently replaced it. Still love the system and have some spectacular video with more planned. It is not a toy. There are toys available for a lot less money that work well as an introduction to the hobby. The 350 QX is an excellent first drone, but not a good first RC aircraft. Also, the manual is not novice friendly. You’re right about the Phantom too. Either unit would be a good choice for a first quadcopter. My recommendation: Purchase from a local hobby shop that can offer assistance, or search your area for people in the hobby. I’ve just purchased one today and am looking forward to my first flight. I agree with you in regard to the battery charging. I think I’ll check out what other options are available. I’ll probably get several batteries and would like to charge them home before I go.